Another day, another awesome prize! 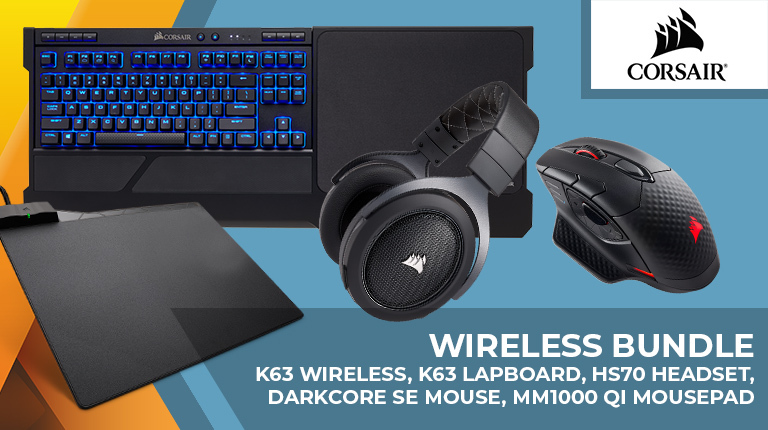 On the 15th day of epicness, one lucky winner will bag a Corsair K63 Wireless Mechanical Gaming Keyboard, a K63 Wireless Gaming Lapboard, a Dark Core RGB SE Mouse, an MM1000 Qi Wireless Charging Mouse Pad and a HS70 Wireless Gaming Headset! The competition winner will be picked at random from all eligible entries that arrive by 09:00 London time on the closing date, December 31, 2018. The prize is a Corsair K63 Wireless Mechanical Gaming Keyboard, a K63 Wireless Gaming Lapboard, a Dark Core RGB SE Mouse, an MM1000 Qi Wireless Charging Mouse Pad and a HS70 Wireless Gaming Headset. I always called a wireless mouse a hamster, but this unfortunately hasn't caught on. Good luck on winning this great Corsair bundle.